Ellis Stafford retired from the Michigan State Police after 23 years of service on August 19th, 2011. He retired from the Michigan State Police at the rank of Inspector and as the Assistant Division Commander of the department’s Special Operations Division. During his career, Ellis held many positions to include Commander of the Investigative Support Section, Assistant Division Commander of the Southeast Criminal Investigation Division, and Assistant Second District Commander. 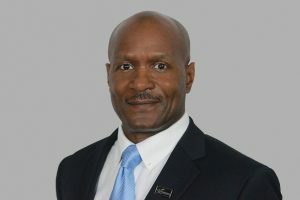 A graduate of the FBI National Academy and Northwestern University’s School of Police Staff and Command, he holds a bachelor’s degree from Eastern Michigan University in Public Administration and is a member of the Southeastern Michigan Association of Chiefs of Police, Wayne County Association of Chief of Police, and Oakland County Chiefs of Police. Ellis is also a veteran of the United States Marine Corps.